Finally, the “elder” 28-75mm F2.8 gets an update. 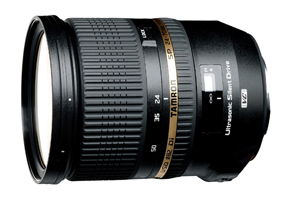 Being the the last brand to have a 24-70mm F2.8 in the line up, this lens is long awaited by Tamron fans. April , 2012, Saitama, Japan – Tamron Co., Ltd. (President & CEO: Morio Ono / Headquarters: Saitama City), a leading manufacturer of optical equipment, announced the introduction of the SP 24-70mm F/2.8 Di VC USD (Model A007), the world’s first*1 full-size high-speed standard zoom lens equipped with VC (Vibration Compensation) image stabilization and USD (Ultrasonic Silent Drive)*2, with resolution at the top of its class. The Canon mount will be released in Japan on April 26, 2012, with the sales dates of Nikon and Sony*3 compatible mounts to be announced later. World’s first*1full-size, high-speed standard zoom with built-in VC (Vibration Compensation). Even when shooting in low-light conditions with a slow shutter speed to render sharpness, Tamron’s acclaimed VC allows for stable handheld camera work, to more fully enjoy the benefits of this high-speed zoom lens. Uses specialized high-grade glass in the three LD elements, three Glass Molded Aspherical Lenses, one Hybrid Aspherical Lens and two XR (Extra Refractive Index) glasses, delivering top-of-the-class quality images suited to this high-grade lens. Using a rounded diaphragm*4, the lens achieves gorgeous blur effects. Features USD*2(Ultrasonic Silent Drive) to power a speedy AF drive together with a continuous manual mechanism. This high-speed standard zoom lens has a wide-end focal length of 24mm that expands the photographic area. The lens adopts the new technology including the latest optical design, VC (Vibration Compensation) image stabilization and USD (Ultrasonic Silent Drive), all in a lighter and more compact package. Moisture-resistant construction helps prevent water from penetrating the lens. *1 For high-speed standard zoom lens compatible with full frame size SLR cameras. Current as of April 5, 2012. (Source: Tamron). *2 USD (Ultrasonic Silent Drive) is Tamron’s proprietary ultrasonic motor drive. *3 The Sony mount does not include VC, because the body of Sony digital SLR cameras includes image stabilization functionality. The product name for Sony cameras is “SP 24-70mm F/2.8 Di USD” without the VC designation. *4 This rounded diaphragm retains a nearly circular shape even when taken two stops down from its fully open state. VC (Vibration Compensation) is Tamron’s proprietary image stabilization system. Tamron’s VC is a three-coil system, whereby three driving coils activate the shake-compensating VC lens group electromagnetically via three ceramic balls. The VC lens elements are held in place only by contact with the ceramic balls, achieving smooth movement with little friction. This provides a stable viewfinder image with excellent tracking performance. And as the VC lens may be moved in parallel using only the motorized control, the mechanical structure has been simplified, enabling the creation of a more compact lens. Because the 24-70 mm F/2.8 Di VC USD is a high-speed zoom lens with maximum aperture of F/2.8, its VC system must drive a lens that is larger and heavier than other zooms. Therefore, the shape, size and layout of the drive coils are all designed to obtain sufficient thrust. The result is a full-size, high-speed zoom that provides the same high level of compensation effect. In the ultrasonic motor, a piezoelectric element arranged in a ring formation generates ultrasonic vibrations in a metallic ring stator, and the vibration energy is used to rotate a metallic ring rotor that is attached to the stator. The rotation energy is in turn transferred from the metallic ring rotor to operate the focus lens. Since the introduction by Tamron of the first Nikon mount lens featuring an internal AF motor, the AF28-300mm F/3.5-6.3 XR Di VC (Model A20), all Nikon mount lenses with the internal AF motor had used the classification code “NII.” Lenses using a coupler system* without an internal AF motor were designated as “N.” Because future Nikon lenses will have the internal AF motor as a standard feature, Tamron has decided to simplify the designation and consolidate all Nikon mount lenses as “N,” eliminating the “NII” designation for future models. This classification code change will be effective beginning with the 18-270mm F/3.5-6.3 Di II VC PZD (Model B008). The “N” classification lenses with coupler systems are: SP AF200-500mm F/5.6-6.3 Di (Model A08); and SP AF180mm F/3.5 Di (Model B01). This entry was posted in Brand: Tamron, Photography Articles & Videos, Uncategorized and tagged DSLR, Lens, Tamron. Bookmark the permalink.